The uploading of the 1928 stanley model mentioned above spurred Derek Kavanaugh to inquire about whether we knew anything about his 1929 Skilsaw. 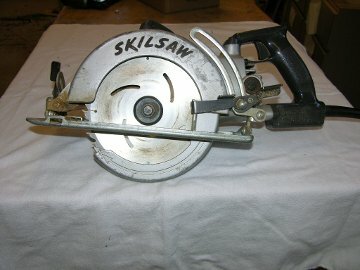 After some investigation, it became evident that the Skilsaw's appearance -- at 10-lbs, it has a 1/2 hp motor, with a 6-in blade -- had what seems to be a greater immediate impact than the heavier Stanley, especially on the house construction industry, where savvy managers of hardware stores and other outlets that sold to the trade detected a strong market, even in a era of the crash of the stock market. When I have time to do a proper job, I will upload some of Derek's photos and a handful of advertisements that appeared in newspapers and magazines immediately after Skilsaw appeared. As I told Derek, the text of the Skilsaw advertisements communicate the sense that the Skilsaw was just what the construction industry needed, that is a tool that would reduce the time-consuming process of dimensioning lumber for the assembly of a house's framing and other contstruction activities that go into the detail of completing the total project required for the completion of a house. On the left is an image is my 1970s model HD 77 Skil Saw, an example of the "workhorse" of this type of power tool. See also my 1927 Stanley Safety Saw This entry is still under construction, so I ask for your patience. I still have to add details of the material on portable circular saws contained in the books by DeCristoforo and Nagyszalanzy. Legend has it that, in 1924-- after watching field hands use machetes to slash away at sugar cane stalks -- the Louisianan, Edmond Michel, invented the world's first electric handsaw. The patent no is 1,512,296. Michel's first attempt was a motorized machete that didn't work very well. His next prototype featured a small, round saw blade driven by a motor that came from a malted milk mixer. Michel probably didn't realize it at the time, but his device was the forebear of the worm-drive motor that made the circular saw a viable product. The worm drive permits the gears of the saw's motor to turn on an angle, thereby allowing for a better transfer of power and increased torque. Word of the invention reached Minneapolis land developer Joseph Sullivan, who came to New Orleans to see Michel. The two men moved to Chicago, rented a loft and incorporated the Michel Electric Handsaw Company in 1924. Michel left the company in 1926 to pursue other inventions. That same year, the company renamed itself Skilsaw, supposedly after Sullivan's wife commented on the difficulty of using the new circular saw. Skilsaw's first salesman followed lumber trucks to construction sites and demonstrated the product on the spot. By 1927, production was up to 2,000 units and the company showed its first profit. The Skilsaw ushered in Skilsaw Inc., which later shortened its name to the Skil Corporation. Skil's parent, Emerson Electric, merged with Bosch Power Tools in 1992. The company is now a wholly owned Bosch subsidiary operating as SB Power Tools. William P Casey Patented Dec. 6, 1927. 17,651,995 UNITED STATES PATENT OFFICE. WILLIAM P. CASEY, Oshkosh , Electric application filed Oct., 11, 1924. serial no. 763,027. In the patent application, Casey declares that his invention makes improvements in electric hand saws of that type which is readily portable and capable of general use in the wood working and kindred arts. It is one of the objects of this invention to provide a compact, unitary, electric hand saw, with which various types of cutters may be employed to permit its use for various types of work. Another object of this invention resides in the provision of a hand saw of the character described, the structure of which affords a strong and durable machine and which is light in weight and well balanced to permit its easy handling by the operator and which is designed for its convenient manufacture without in any manner interfering with its efficient operation. This invention has as a further object the provision of improved means for effecting the ready adjustment of the depth of cut, which means has simple ment for limiting its movement. What is interesting is that it wasn't until feb 10, 1931, that patent no 1,792,204 was given wallace for this tool. The Wallace Electric Handsaw is light in weight and easy to handle. Its chief feature is absolute SAFETY. The blade is entirely covered at all times. The motor, the switch, the operator, and the saw itself are completely protected against injury. At the same time the Michel Electric Handsaw Company was developing the first portable electric circular saw, Bill Casey was designing a similar device. His tool is often referred to as the Casey Electric Hand Tool (Illus. 2). The machine was patented in 1919. The Casey machine is a specialty portable circular saw. It was designed to make straight line cuts for openings in doors, but it also cuts dadoes and V grooves (Illus. 3). Several guide tracks are available for use with the Casey Electric Hand Tool. They control the path of the tool and increase the accuracy of the dado or cut. The Casey Manufacturing Company is still in business in Oshkosh, Wisconsin, selling and leasing its machines. Porter Cable also contributed greatly to the advancement of portable circular saws. In 1929, it developed the anti-kick clutch for circular saw safety (Illus. 4), which reduced the chance of a kickback when the operator used a portable circular saw. In 1924, the first portable circular saw was marketed by the Michel Electric Handsaw Company, which was cofounded by Edmond Michel, the inventor of the portable circular saw, and Joseph Sullivan, a land developer. Around 1938, Porter Cable developed and marketed the first helical-gear portable circular saw with a right-hand drive. Until this saw was marketed, all saws used the worm drive. To date, all portable circular saws are either worm-gear or helical-gear drive. Porter Cable's latest contribution was in 1983, when it marketed the first microprocessor-controlled portable circular saw (Illus. 5). The microprocessor allows the saw to start slowly and gradually increase speed. It also senses cutting resistance and increases or decreases cutting speed accordingly. An indicator light tells the operator whether or not the saw is working under ideal conditions. In 1962, Skil Corporation marketed the first line of double-insulated professional tools. Double-insulated portable circular saws do not require a grounded outlet. The saw itself is protected by a nonconducting case. This design makes electric shock almost impossible. Skil has continued to market well-engineered portable circular saws (Illus. 6). Another advancement that makes electric shock impossible is the cordless or battery-operated saw (Illus. 7). During the late 1970s and early 1980s, the technology related to batteries advanced rapidly. This led to the development of a small, light, and powerful battery that was capable of driving a portable circular saw (Illus. 8). Motors also got smaller, but more powerful, during the same time period. This led to the development of portable circular saws with blades 10 inches in diameter and over (Illus. 9 and 10). Electric brakes were added to make these large saws safer. The electric brake stops the blade as soon as the trigger switch is released. Information on this saw is not yet complete. This is a photo the 1927 Stanley Safety saw that I managed to purchase at, of all events, a "conference on woodworking hand tools". Oddly for the situation, one of the exhibitors at the "Best in the West" Pacific Northwest [Hand] Tool Collectors August, 2010, Conference in Clackamas, OR, was selling this saw for a friend in California. With hundreds of hand tool enthusiasts milling around, looking at displays of old hand tools, it was a once-in-a-lifetime opportunity for me to make the purchase, without anyone to bargain with me over the price. My saw is cast aluminum, Style CC 7, Serial no 3914 A, Model 102, 7, Amps, 100 Volts, and is operational. The citations below are the result of a Google Books Search. While they look like they contain some pertinent info, they come without pagination, unfortunately. Until I get the exact pages of each article, the info they contain cannot be more informatively set out. Contractors of concrete work are using this Crowe safety saw and advise that it is speeding up their work and saving them money, and that it is a machine which absolutely tills the bill. It is easily taken from one part of the work to another and the Type A-12 cutting 4t/-in. timber takes care of all their work. It is easy to see why the saw will save its cost when consideration is given to the fact that it is customary to remove the timbers to a fixed saw or have two men with a cross-cut saw to do the work. Crowe safety saw requires but one man to operate it and it will cut material 4 by 8 ins. in 8 seconds. Crowe safety saws are manufactured in three sizes, designated as A-6, A-8 and A-12. The smaller one, A-6, weighs 9 lbs. and will cut 1.5-in. stuff ; A-8 weighs 15 lbs. and will cut material 2%. ins. thick, while A-12 weighs 30 lbs. and will cut 4.25-in. material. Motors are universal and are supplied for either 110 or 220 voltage. Each motor supplies more than the amount of power required. These saws are easily handled by one man. Carpenters and mechanics like to use this machine because it saves them the hard work of hand sawing. One of the big features of this saw, and one that will appeal to concrete products workers, is the fact that the saw is guarded and safe at all times. It is impossible for the workman to remove the saw from the lumber without the guard covering the saw and locking itself so that it cannot be removed until it is again on the lumber in a position for sawing, where it is impossible for a workman to cut himself. The guard is automatic. This safety first feature is something worth while. The guard feature is on each one of the three different size machines and it has been submitted to various safety organizations and their approval has been obtained. These saws are manufactured by the Crowe Manufacturing Corp., Inc., 133 East Third street, Cincinnati, 0. 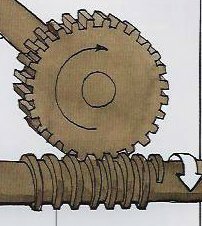 On the left is an artist's rendering of a modern worm-drive gear. First, the worm-drive saw, especially the Skilsaw HD 77, is renowned as the workhorse on building sites. Most cabinetmakers, one expects, will own a HD 77. In an 1928 issue of Building Age a very brief article reports the claim by Crowe Manufacturing that their portable saw is now improved, with the addition of "reduction gears", which enables the saw to operate "with double the power and efficiency". With some background on these portable circular saws, when you hear "double power and efficiency", immediately what comes to mind is "worm-drive-gears", and thus doubling power with reduction gears causes you to think that Crowe manufacturing added what is now called worm-drive-gears to its portable saw. Below are a few references from the 19th century on worm drive gears, yielded from searches on the Google Books search-engine. I further claim the combination of mechanism by which I am enabled to regulate the length of each successive layer of yarn composing the cop, the same consisting of the cam, fr and made to rotate on the scroll shaft, as described, the worm gear, u', endless screw, 1', shaft, w', frame, x', ratchet wheel, y', vibrating lever, a% impelling pall, bs, lever, % standard, f2, projection, z, and rod, h', extending downwards from the ring rail, or their mechanical equivalents, the whole being combined and made to operate substantially as specified. Source: United States. Patent Office Report of the Commissioner of Patents - 1848, page 984.
article on "stanley safety saw"